Wedding sparklers are not just fun, they are also a great way to create spectacular scenes for your wedding photographer! You may want to take things further by creating your own sparkler photo ops so you know your photographer will get amazing shots that you’ll want to keep for decades. Sparklers are often used to create shapes, letters and numbers that are literally written in fire! For a romantic event like a wedding, simple heart shapes and circles are a great choice. It may seem overdone, but each wedding sparkler writing photo will look unique because of your specific décor style and venue. Kissing photos are a common find at weddings, but your sparklers can give them more life and detail. Have the bride and groom each hold a burning sparkler while commemorating the event with a passionate kiss or other affectionate gesture. This is a great shot to capture after dark! off a happy bride and groom! 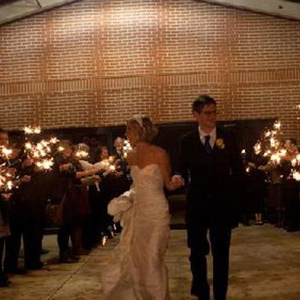 Wedding sparklers are a wonderful way to send off the bride and groom! Make sure the guests and bridal party are aware of this event so everyone participates. Have guests with burning sparklers line up to create rows then have them raise their fiery wands over the bride and groom as they pass by! This is also a great way to get exciting shots of the bride and groom in the foreground with the sparkler-carrying crowd behind them. Another fun wedding sparkler shot that’s easy to create includes the bride, groom and a set of sparklers! Have the happy couple hold a sparkler each at arm’s length. Capture the sparkler in the foreground with the smiling pair in the background. You can add more love appeal by having them kiss and/or gaze into each other’s eyes! Sparklers are fun way to light up the wedding cake! Make sure the photographer gets first dibs on great shots of the cake once the sparklers are lit. Place a single sparkler on top or decorate with a few, depending on the size and height of your wedding cake.